You are aware that since inauguration of our Balaji Sabhagriha & Prarthana within a span of only 5 years, all the Mathadhipatis (Swamijis ) of the four Mutts of our GSB Community including the shishya swamiji of Sri.Kashi Mutt have visited our Sabhgriha & Prarthana Mandir & we are privileged to be BLESSED by them. It gives us immense pleasure in informing that by the Grace of Lord Balaji & the divine blessings of our Swamijis, every Saturday during our weekly Bhajan session, around 200-250 samaj bandhavas & well wishers are gathering at our Mandir and we are conducting various spiritual, social, cultural, educational activities for the benefit of our Samaj Bandhavas in particular & well wishers in general. Our Bhajan Mandali has gained good name & fame in Mumbai & its suburbs. We have formed Mahila Vibhag & Yuva Vibhag which are active in conducting various activities for the benefit of the Mahila Vrinda and also to bring our Yuva Vrinda on the right path. In a nutshell, we are happy that we could bring together our Samajbandhavas residing in and around Vasai Road and involve them in the activities of our organisation thereby bringing awareness in our people, the need for religious, social & spiritual activities and to lead a meaningful, contented & happy life. We have our own website “ www.balajisevasamiti.org” developed by one of our active member which is being updated immediately and gives the details of our activities. We also decided to felicitate / honour our donors who have donated an amount of Rs.10,000/- and above on an appropriate occasion. We are fortunate that H.H.Shivananda Saraswati Swamiji are now camping at Walkeshwar, Mumbai. H.H. in response to our earnest request, have consented to visit our Balaji Sabhagriha & Prarthana Mandir on Sunday, the 12th June 2011 at 2.30 p.m. to BLESS all of us on completion of 5 glorious years since inauguration of our Sabhagriha & Prarthana Mandir and also to felicitate / honour our donors who have donated Rs.10,000/- and above. We take this opportunity to invite you and your family for the above function to be held at our Balaji Sabhgriha & Prarthana Mandir and be blessed by His Holiness & Lord Shree Balaji. The details of the programme are given overleaf. Looking forward to your participation & continued support. Always in the devotion of Lord Shree Balaji & praying at the Lotus feet of His Holiness. at the entrance of Balaji Sabhagriha & Prarthana Mandir……………………2.30 p.m.
2. Aarti to Lord Shree Balaji by His Holiness………………………………………..2.45 p.m.
(i)	Veda Ghosha by Vaidik Vrinda……………………………………………3.00 p.m.
By Committee members…. ……………………………………………….3.15 p.m.
5. Aashirvachan by His Holiness………………………………………………………4.15 p.m.
6. Phala Mantrakshatam to all the devotees ( if time permits)………………..4.45 p.m.
To place of camp at Walkeshwar, Mumbai……………………………………..5.00 p.m.
8. Refreshment ( Due to Ekadshi)……………………………………………………..5.30p.m. onwards. You being one such donor / Head of Joint Donor, it is our pleasure to falicitate / Honour you (if married with your wife) on the occassion by the august hands of Param Poojya. We therefore earnestly request you to be present. Please do not miss this devine opportunity to be blessed / felicitated by Param Poojya. Please confirm your attendence forr the function, well in advance over the phone 0250-2345111 or in person to our Samiti’s Office Managers Sri Prakash G Shenoy or Sri Ramakrishna Hegde, for enabling us to make proper arrangements for smooth functioning of the event. Balaji Seva Samiti, Vasai Road. SINCE WE PROPOSE TO FELICITATE ONLY ONE COUPLE OF EACH ELIGIBLE DONORS, IN CASE YOUR DONATION IS MADE JOINTLY BY YOUR FAMILY MEMBERS, WE HAVE DECIDED TO FELICITATE THE HEAD OF THE FAMILY. HOWEVER, IF NOT HEAD OF THE FAMILY, PLEASE DECIDE AMOUNG YOURSELVES AND INFORM WELL IN ADVANCE WHOM TO FELICITAATE FROM YOUR FAMILY. 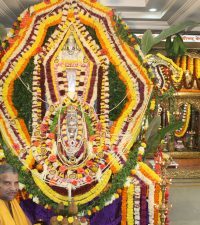 Pakshi Jagaran is followed, for the last one week, during “Kartika Masa”, at our Balaji Mandir, which ends on the day of “Tulasi Pooja” i.e. on Thursday, 18th November for this year 2010. It begins at 5 AM in the morning and ends at 6 AM. All devotees come with their own “Arati” and “Dhai Povu” as prasad. On an average 25 – 30 people attend, which increases to 50 – 60 during holidays. Bhajan @ Sri. Ram Mandir, Wadala Ashadi Ekadashi 21st July 2010.